Supporters of Ukraine’s ex-PM Yulia Tymoshenko are continuing their sit-in near the district court where she was arrested, defying a ban on protests. Tymoshenko’s lawyers say her arrest may be appealed as early as Monday. Yulia Tymoshenko is making no complaint about conditions in the pre-trial facility where she is being held. According to ombudsmen’s representative Anatoly Paliy, who visited Tymoshenko, she was “brave and smiling.” The opposition leader thanked supporters who had gathered outside the court and pre-trial facility. Outside the court where the opposition leader was arrested on Friday, around 150 people are reportedly continuing their protest. 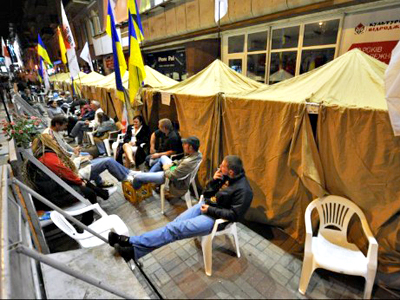 Despite a court ban on all protests in support of Tymoshenko on Friday, they have continued to occupy central Kiev’s main thoroughfare. Sergey Vlasenko, a member of Tymoshenko’s Fatherland Party, insists they are not protesting, merely receiving citizens who support the party, and are violating no laws. On Saturday night they launched an appeal against the court’s ban. "It was decided to appeal against the court's decision to the Kiev Court of Appeal. Under the legislation after the appeal had been received, the court's decision was suspended," an MP with the Batkivshchyna party, Sergei Mishchenko, told the Ukrainskaya Pravda. 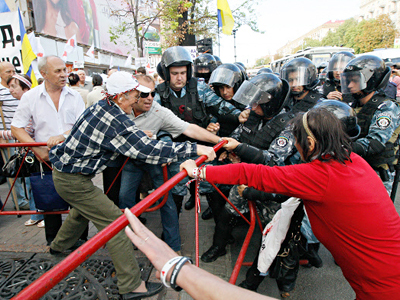 On Sunday morning, police surrounded the tent city and blocked roads leading to the Pechersky court with metal barriers. According to the Interfax news agency, there are also some 200 activists of the youth wing of Tymoshenko’s Fatherland Party outside of the facility where she is currently held. They are holding party flags and placards saying "Yulia, you are not alone," and "Yulia, we are with you!" Tymoshenko was arrested on Friday in Pechersky district court during a hearing to investigate allegations that she abused her power in connection with gas contracts during her term as prime minister in 2009. She is currently being held in Lukyanovsky detention facility. Tymoshenko's lawyer, Yury Sukhov, said he would appeal her arrest on Monday. But people’s deputy Sergey Vlasenko told the press that Tymoshenko’s defense is to apply to Kiev’s Court of Appeal on Sunday. The outcome will be known within five days. Some Western countries have already reacted to the arrest of former Ukrainian PM Yulia Tymoshenko. Canada has urged the Ukrainian government to respect judicial independence and continue “to try to make Ukrainian society peaceful and democratic”. “Canada is concerned over the evident political repression aimed against Yulia Tymoshenko, which was followed by her arrest,” said the message from the head of the Canadian Department of External Affairs John Russell Baird, published on the department’s website. In addition to Canada, the UK and the USA have both expressed concern over Tymoshenko’s arrest. The UK together with the EU and their European partners will continue to closely observe the legal process. 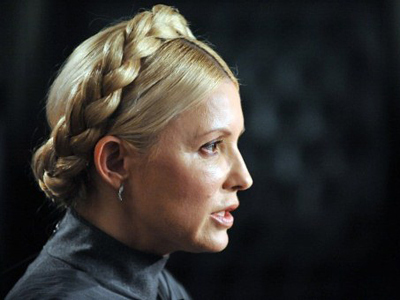 The US called for the Ukrainian authorities to consider releasing Tymoshenko immediately.